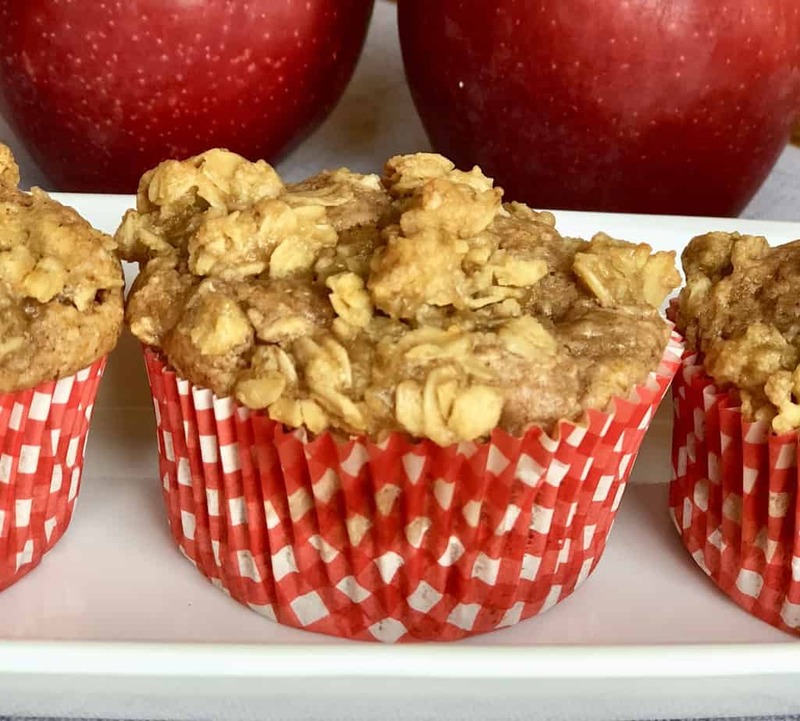 Apple Pie Muffins With Oatmeal Streusel Topping – 20 Minute Recipe! Here it is! The best and easiest muffins recipe you will need for all your events. These apple pie muffins are made up of just 2 ingredients! TWO!! And the streusel topping is so easy you’ll have the recipe memorized after the first time you make them. From beginning to end, these muffins only take 25 minutes to make. So pin these on your “easy desserts” board – especially if you get home from work and realize you forgot to bake something for the party you agreed to attend. 25 minutes and DONE. Want more easy recipes? I have a bunch of them! These are the only 2 ingredients for the cupcakes! Stock up on these – along with the streusel ingredients (oatmeal, brown sugar and butter) and you’ll always have the ingredients for my easy cupcakes. Yes, to make my apple pie muffins, you just need cake mix, canned apples, and a little bit of water. My entire family adores these cupcakes reheated the next day or even just room temperature. They are just as delicious as when they come out of the oven. Ok, let’s get the recipe! A very simple 2-ingredient muffin that tastes like apple pie! Preheat oven to 350 degrees farenhiet. Pulse canned apples in a food processor until completely chopped. Combine chopped apples and cake mix in a large mixing bowl. Add a few tablespoons water until mix resembles cupcake batter. Fill cupcake liners 3/4 full with batter. Combine all the ingredients for the streusel topping in a medium mixing bowl. Cover each cupcake with about a tablespoon of topping. Bake in preheated oven for 20 minutes or until toothpick comes out clean. Here are some more delicious apple recipes you’ll love!